The Isle of Man Symphony Orchestra’s forthcoming Opera Gala on Saturday 24th November in the Villa Marina, Royal Hall will include several Sheean Prash members in the ranks of the brass section of the orchestra. Chris Weeks will lead the French horn section and Juan Wright will be on Trombone. This evening of Operatic gems includes music by Rossini, Puccini and Verdi to name just a few. The concert will feature well-known talented local soloists Kristene Sutcliffe, Mandy Griffin and Karen Elliott as well as the Isle of Man Choral Society in a number of famous operatic choruses under the baton of their Chorus Master Julian Power. Tickets for this event which starts at 8.00pm are now on sale from the Villa Marina Box Office or the Welcome Centre. You can also book online at: www.villagaiety.com or call the Box Office on: 600555. Ticket are priced at: Adult £15: Concessions (OAP, Friend of IOMSO, CFC) £12.50: Child/Student in full-time education £5. Please note that children’s tickets cannot be booked online. I hope those of you who can make it will enjoy this rare opportunity to hear some of the greatest operatic music accompanied by a full symphony orchestra making this an evening not to be missed! 18th October 2012 John's plans are full of Eastern Promise! 15th October 2012 There’s a How de do! Local theatre-goers and fans of Gilbert & Sullivan are in for a treat next week when the Manx Gilbert and Sullivan Society put on their production of the well-known G&S comic opera The Mikado at the Gaiety Theatre between 23rd – 27th October starting at 7.30pm. As well as a whole host of talented principals on stage including Cleveland medal winner Andrew Williamson in the title role and Simon Fletcher in the of Ko-Ko. Within the ranks of the pit orchestra is former Sheean Prash trumpeter Jennifer Cook and trombonist Juan Wright. The production promises to be something very special. Tickets can be purchased from the Gaiety Theatre Box Office on 600555 or the Welcome Centre at the Sea Terminal. As usual the G&S Society have organised transport for those travelling from the north, south or west of the island. For more details contact either 424683 or 676227. Sheean Prash have had the great honour of being invited to perform alongside both the Lon Vane Ladies and Lon Dhoo Male Voice Choirs in their forthcoming concert 'A Choral Celebration'. The concert will take place on Saturday 13th October at St Andrew's Church in Douglas. The event is being supported by the Douglas Buxton Music Trust who work tirelessly to support a number of musical organisations on the Island. The quintet are to perform two spots during the concert and will perform an item with the massed choirs as a finale to the concert. Further details of the programme will follow very soon. This promises to be very special evening Tickets are priced at £5 and if you would like to purchase tickets contact any choir member, or you can phone either 623479 or 627450 or failing that just turn up on the night and buy a ticket on the door! The sunset city of Peel is set to resound to the best of British Music when Sheean Prash perform their programme of British music for the town's pensioners at the Philip Christian Centre on Wednesday 3rd October. The programme of music will include a wide variety of British music ranging from a medieval composition attributed to Henry VIII, through to a couple of hits by the Beatles namely Yesterday and the appropriately titled When I'm 64! This concert is a return visit to the Philip Christian Centre for Sheean Prash following their very successful singalong concert for the pensioners last year. The concert starts at 7.45pm and the programme will last about an hour. Admission is free with refreshments to be served after the concert. 25th August 2012 By Association with the Manx South Africans! Juan Wright recently received a request if he would grant permission for his transcription for brass quintet of the Manx National Anthem to be used in a Thanksgiving service as part of the Queen’s Diamond Jubilee Celebrations in Johannesburg, South Africa on Saturday 15th September. Kevin Smith is Chairman of the South African Manx Association and was delighted by Juan’s agreement to include his brass parts for the Manx National Anthem in the service. “We have a very active Manx Association and they will be absolutely delighted to be able to sing the Manx National Anthem at the Service. We sing a fair amount of traditional Manx songs at our meetings during the year. "Sheean Prash would like to take this opportunity to wish the South African Manx Association all the very best for their forthcoming Thanksgiving Service. 20th August 2012 Russell's an Early Music Master! Former Sheean Prash Trumpeter and French hornist Russell Gilmour, son of David and Janet Gilmour of Sunningdale Drive, Onchan and grandson of the late Jessie and George Russell has gained a master of music degree with distinction from the prestigious Royal College of Music in London where he studied early music on both the natural trumpet and cornetto. This follows on from his undergraduate music degree, which he obtained in 2010 at the Royal Northern College of Music in Manchester. As part of his studies at the RNCM he completed a PGCE which has given him qualified teacher status as well as being a Licentiate of the Royal School of Music. A full biography of Russell can be found on his website: http://www.russellgilmour.co.uk/ or you can view a short biography in the gallery within the Sheean Prash website. 2nd August 2012 Grant’s well chuffed with his nomination! Castletown’s Railway Station is the last remaining wholly-original station on the island’s steam railway network, and thanks to the efforts employee Grant Taylor, the listed building is looking better than ever.Grant’s work improving the area has not gone unnoticed by former Castletown commissioner Carol Quine, who has nominated him for the green award in the Flybe Pride in Mann Awards. Carol said of him: ‘Grant goes above and beyond his duties, often staying late or doing things on his day off. He also spends his own money on things like planks, coal, logs and picture frames. Grant only works for Isle of Man Transport as a station master on a part-time basis, so much of the aesthetic work he has done is in his own time. ‘People say I’m mad, but I spend my days off there because I can! I get paid to do my hobby,’ said Grant. ‘I spend a lot of my free time down at the station doing things like painting, helping out because the full-time staff are over stretched.He sees his biggest achievement as the station’s waiting room. ‘When I started four years ago, it was just an empty room, but I transformed the place,’ said Grant. It now boasts a coal fire, and the walls are adorned with memorabilia and old photographs. Some are donated or purchased with donated funds, but others are bought from his own pocket. He has also put his gardening skills to use. ‘It all stems from keeping busy between the times of the trains coming through,’ laughed Grant. ‘We now have a large flower bed running alongside the station made of railway sleepers, it adds colour. And we have twice as many hanging baskets as last year, thanks to a donation from Castletown Commissioners.’ The station was built in 1874, with local limestone, and starred in the Thomas the Tank Engine movie filmed in the island in 1999. It made an early impression on Grant; he has childhood memories of the station as his parents were from the town. He is a lifelong railway enthusiast, and his first job out of school was at Douglas Railway Station. As a station master, he is able to channel that enthusiasm into Castletown. ‘People who haven’t been through the station for a while always comment on the change,’ said Grant. ‘The visitors book is nearly full, and it only went in at the start of the season! Click here to see the other nominees Nominations for this year’s Pride in Mann awards have now closed. After two successful years with Sheean Prash Helen Quaggin-Molloy is to leave the quintet shortly for pastures new. Helen's last official appearance with Sheean Prash is a Wurlitzer lunchtime concert on Wednesday 1st August at the Villa Arcade in Douglas starting at 1.00pm. The quintet will share the concert with Cathedral organist Dr. Peter Litman and talented young singer Georgia Maddocks. There will be a retiring collection in aid of the St German's Cathedral Foundation for Music and the Arts. During her time with Sheean Prash Helen has been a much valued member and it is her we have to thank for both negotiating a regular rehearsal venue and organising a number of the quintet’s engagements at both the Mailbox Restaurant last Christmas and our concert at the Strand Shopping Centre to support local headteacher Adrian Shorthouse’s fundraising efforts for the Alzheimers Society last February. All the quintet members would like to wish Helen and her family well for their move to New Zealand and want her to know that if she does pop back at any point she will very welcome to come along and play with the quintet! Helen is also a dedicated member of the Isle of Man Wind Orchestra. Her final engagement with them is tomorrow Sunday 22nd July at the Villa Arcade. If you have a farewell message for Helen you can email it to Juan Wright and they will be posted on the quintet website. We hope to be able to make an official announcement about Helen’s successor on trumpet shortly. 2nd June 2012 St. Catherine's Church Organ's Special Treatment! Sheean Prash’s forthcoming concert at St Catherine’s Church as part of the Port Erin Commissioners summer concert series 2012 will give members of the public an opportunity to admire the newly restored pipe organ. Local organ builder Peter Jones and his team of helpers have spent some six weeks painstakingly working on the 15-stop instrument which was built by local organ builder Moses Morgan in 1912 the same year as the Titanic’s fateful maiden voyage. Mr Jones a veteran organ builder and restorer for some thirty years on the island said ‘The original key mechanism of the instrument continues to function as well as it did 100 years ago. But the pedal Violone stop is controlled by a pneumatic action which needs to have its many leather membranes renewed every 60 or more years’ explained Peter. In addition the 25 front display pipes which had become dull and pitted have been removed and repainted. The instrument is now ready to use in the regularly weekly services and also at special events such as the series of summer concerts organised by Port Erin Commissioners which take place each Wednesday evening at 8pm from 13th June to 19th September. Local Headteacher Adrian Shorthouse who ran the London Marathon for a cause close to his heart has raised more than double his target. Adrian tackled the marathon, his first, in memory of his mum, Elsie, who died with Alzheimer’s disease. He completed it in just four hours seven minutes. Back in February Sheean Prash performed at the Strand Shopping Centre to help raise awareness of his fundraising efforts. He initially set out to raise £3,000 for Alzheimer’s Society Isle of Man but has collected £6,400 thanks to the generosity of family and friends, parents, children and staff at Scoill Vallajeelt, colleagues at the Department of Education and Children and members of the public, who put money into buckets, donated raffle prizes, held dress down days and gave a concert. Carol Frearson, Helen Fowden, Marke Railton, Jonathan Ayres, John Gill and Jo Overty were part of a fundraising team backing Adrian and raising money that will help Alzheimer’s Society to extend its services in the Isle of Man. ‘This has been very much a team effort. I can’t thank them enough for their time and dedication to the cause. This contribution will go a long way towards helping people in the Island cope with this severe and debilitating disease,’ Adrian said. Alzheimer’s Society plans to introduce specialised dementia services locally in the near future. It is predicted that by 2021, as many as 1,532 people in the Island will have dementia. ‘Anne-Marie Cagliarini, Alzheimer’s Society Locality Manager for Merseyside and the Isle of Man, said the generosity of local people in raising funds and the tireless work of local trustees meant the charity would open an office offering specialised support and information to those living with dementia and their carers and families. ‘‘People will be able to drop in to speak with our outreach workers for specialised support and information to help all people live well with dementia,’ she said. ‘Support groups would be created in different parts of the Island to make help and advice accessible to all, Anne-Marie added. ‘Fran D’Arcy, Community Fundraiser for Alzheimer's Society, said: ‘We are extremely grateful to Adrian and his family, friends and colleagues for all the time and effort that they have put in to their fundraising for us. Many congratulations to Adrian on completing the challenge and thank you to everyone who has supported him and helped him to exceed his fundraising target. A Kapellmeister and organist by trade, Johann Georg Albrechtsberger (1736-1809) was a much respected contemporary of Haydn and as a teacher his students included Beethoven (who introduced the trombone into the symphony). It is believed that Albrechtsberger wrote his Alto Trombone Concerto in Bb Major for the great master of the alto trombone, Austrian musician Thomas Gschladt thus introducing the trombone to the role of concerto soloist! After many years of obscurity the concerto was rediscovered in the 1960’s and since then has been performed and recorded by a number of trombonists including Swedish virtuoso Christian Lindberg, current principal trombonist of the Vienna Philharmonic Ian Bousfield and Canadian Alain Trudel. The concert begins at 3.00pm and Admission is free. The afternoon will feature a number of other chamber works and showcase other accomplished soloists from within the ranks of the IOMSO. More information about the concert will appear on the IOMSO website shortly. Sheean Prash have finalised their programme of audience's requests to be performed on Tuesday 22nd May at St German's Cathedral. Kevin Ford from Three FM is compering the concert and the quintet are very much looking forward to performing at St German's Cathedral again and feel particularly honoured to be opening this summer's season of concerts. The Isle of Man Wind Orchestra had their first rehearsal tonight on “Yn Scollag Aeg” which was commissioned by the Manx Heritage Foundation to mark the 100th anniversary of the birth of Mona Douglas. Within the brass section were Sheean Prash members Helen Quaggin-Molloy (1st Trumpet) and Juan Wright deputising on trombone. The world premiere of the piece which was composed by IoMWO conductor Paul Dunderdale will take place at the wind orchestra's Summer concert at Peel Cathedral on Tuesday 10th July at 7.45pm. Admission to the concert is free with a retiring collection in aid of Cathedral funds. Peter trained as an organ scholar with Dr David Flood at Canterbury Cathedral, Neil Wright at Farnborough Abbey, and latterly with Roger Fisher, former Organist and Master of Choirsters at Chester Cathedral. He holds both graduate and postgraduate degrees in Music Performance and Choral Direction and is a Fellow of the London College of Music. As a regular organ recitalist, Peter will in 2012 give recitals at Chester and Liverpool Cathedrals. Christiane Litman will take on the role of Community Music Outreach Worker. A talented singer and viola player, she is a qualified Primary School teacher. Christiane is passionate about involving children in choirs and holds an ABCD certificate in Choir direction with young voices. You can find out more about Peter’s life and experience on his own website. There are still s ome free tickets remaining for next weekend’s Manx Youth Orchestra Reunion Concert on Saturday 24th March at St. Ninian’s High School starting at 12.00pm. John Kinley, from the Music Service, said: ‘The appeal has led to more than 100 former members coming forward and they will join the 60 current musicians for what promises to be a lovely event. ‘The past members are coming from all over the British Isles and it is amazing how many have gone on to forge careers in music. We are being joined by an Army Director of Music, a music therapist and several music teachers, among others. ‘Many of those who responded to our appeal still play music in one form or other with orchestras and bands. Others haven’t played for years and have had to dig out their instruments from their lofts or borrow instruments for the occasion. The orchestra will be conducted by the current musical director, the DEC’s Head of Music Service Maggie Richardson, and former conductors/heads of music service Graham Kirkland and Bernard Osborne. John Kinley, who played with the orchestra as a teenager, will also lead part of the performance. There will be a retiring collection in aid of the Friends of the Manx Youth Orchestra. At the post-concert reception, organised by the Friends, photographs/memorabilia of the MYO will be on display, including programmes dating back to the early years. Players and audience members are invited to bring along anything of interest or contact John at the Music Centre to arrange to loan it. Anyone wishing to attend the concert should contact the Music Centre in Lord Street, Douglas, as soon as possible on 686555. 12th March 2012 Mr Shorthouse takes the lead! I have recently received the exciting news that local head teacher Adrian Shorthouse's fundraising efforts for the Alzheimer's Society have so far reached £4,600 making Adrian the current leading fundraiser for Alzheimers. Last month Sheean Prash performed in the Strand Shopping Centre whilst Adrian and his supporters rattled their buckets. As a follow up to his preparations for the London Marathon the Alzheimer’s Society have invited him to be their guest runner in a Half Marathon event taking place at Silverstone race circuit next March 2013. With the London Marathon not far away we wish Adrian all the very best for his final race preparations. Look out for him on BBC 1’s coverage of the Virgin London Marathon on the morning of 22nd April 2012. Below is the transcript from an interview by Paul Emmett with former Sheean Prash member Russell Gilmour on Tuesday 19th April 2011 for brass website: The Brass Section. Russell played with the quintet in its infancy on cornet, then French horn and later guested on trumpet for several performances before going off to study trumpet at the Royal Northern College of Music in Manchester and as you will discover if you read on he has now embarked on further study in London. What is your name? Russell Gilmour. How old are you? 22. Where do you live? London… but in the last 12 months I've lived in Manchester (where I did my Undergraduate Degree) and I'm originally from the Isle of Man. What is your instrument? Trumpet and Natural Trumpet. What make of instrument do you use? Frank Tomes - Natural Trumpet. When did you start to play your instrument? I started playing the Trumpet when I was 5 and I started the Natural Trumpet in my first term at the Royal Northern College of Music (aged 18). What drew you to your instrument in the first place? My older sister started having flute lessons in school when she was 8 or 9. She went into the local music shop to buy a flute and she was persuaded to join a brass band called Onchan Silver Band while she was there!A few weeks later she brought an old cornet home (on 17th January 1993) and I had a go on it and loved it! By the way: It's a little-known fact that Mark Cavendish (now a very successful Tour de France and Olympic cyclist) started learning the Cornet at the same time as me and my sister. Around the same time, I also remember watching the film "Hook" (with the musical score by John Williams). I remember how excited I got every time the brass entered (but at that age I did not know why I was so excited). I watched it back hundreds of times and noticed that I always got excited in the same places. I eventually realised that it was the music that was doing it! I think what attracted (and still attracts) me to the Trumpet is the fact that it is so close to the voice. I've always loved to make funny sounds with my mouth, or try to recreate regional accents etc. Playing the trumpet is as much about imitating sounds as anything else and I think that is why I have always found it a fulfilling instrument to play. Playing the trumpet also attracts a certain kind of person - trumpeters are often good joke tellers and real 'characters'!! There are several reasons I started to play the Natural Trumpet when I was 18. My A Level music teacher on the Isle of Man is married to a trumpet player who went to the Royal College of Music and we had a barbecue at their house shortly after the A level results had been published in 2006. He showed me some of his trumpets (that was the first time I had seen even a piccolo trumpet) and I had a go on his Natural Trumpet (although very quietly as his one year old son was asleep in the room next-door). I'd played French horn for a time before this (as well as the trumpet) and I liked the fact that the Natural Trumpet had the best of both worlds: in being an eight foot instrument and not being too low for me. That September, I went to the RNCM. Just before Christmas, David Staff led an "Introduction to Historical Instruments" which really broadened by horizons. It came to the end of the class where all of the new trumpet players had to try the Natural Trumpet (without holes) in front of the whole trumpet department. I was one of the only people to get a recognisable tune out of the instrument (and some others had even had lessons on this instrument before). Do you play any other instruments? I sing lots and play the Piano a bit. Brass-wise: I play Cornetto (Zink), Keyed Trumpet and basically any instrument I can get my hands on! What did you want to be when you grew up as a child? As a really young kid I used to say "A dinosaur" and then later "a steam train driver" (I got to drive the steam trains several times when I volunteered on the Groudle Glen Railway before I went to University); but, as far back as I can remember, my dream has been to be a trumpet player - but there were a few moments along the way where I doubted this and wanted to be an architect, photographer or work for Apple Inc.
What is your day job? Playing (and studying) the trumpet. I'm also a qualified teacher too, but I don't do that much teaching at the moment. If you could have any other job in the world what would it be? I can honestly say, more of what I am doing now. Do you have a family? My close family are: my Sister, my Mum, my Dad and my Nan. What is an average day for you like? Busy! It varies a lot, but it's always busy. How much do you need to practice your instrument? This also varies between not at all and a lot. It depends what I have got on. Playing any brass instrument is a very physical thing and just like an athlete, you know how much you need to do to be in good shape. In terms of learning what to play, I can do the majority of this by listening to a recording of it, or by singing the part through in my head. I find that knowing what I need to play ("auralisation") makes the right notes come out in the right order. This kind of practice often happens without having a trumpet in my hands. What musical education did you have? A mixture really. I was very lucky to get free music lessons in school - thanks to the Isle of Man Department of Education Music Service. I had a very inspiring teacher. He is a trombone player called Steve Wortley (who has now retired). He trained a staggering number of brass players on the Isle of Man and many of his ex-students are now students at conservatoires or professionals. His incredible musicianship and talent rubbed off on his students. I was also in a lot of youth and amateur groups including a Youth Orchestra, Wind Orchestra, Swing Band and Brass Band - all of which contributed to my musical training. What was your first paid performance? Well, a few possible answers here. I remember the day I realised I might be able to make money from playing. I was about eleven and everyone in our band was given £2 (yes, just £2) for playing at a ceremony on Tynwald Day (the Isle of Man's National Holiday). I was so chuffed to get that pair of pound coins and it made me realise that there could be something in this. My first paid gig in Manchester was in Manchester Cathedral doing 2nd trumpet in the Messiah with Manchester Baroque. My first paid performance in London was in Westminster Abbey in December 2009. I played Handel's "Let the Bright Seraphim" from Samson with Anna Sandstrøm (Soprano) in a Christmas evensong service which celebrated the music and poetry of those buried inside Westminster Abbey. How often do you perform? Regularly. At least once a week I will have a concert of some description. Some weeks there will be three or four concerts and others there will be none, but in the time between I am always keeping myself busy. What are you currently working on? Bach's Second Brandenburg Concerto (on the Natural Trumpet) for a Concert on the 24th June at the Royal College of Music. I'm currently doing a lot of arranging, just because it is something I love doing and I'm hoping to record an album with my brilliant brass quintet. I'm working on writing a tutor for the Natural Trumpet with my ex-teacher and colleague David Staff. I've just been loaned some coiled natural trumpets, so I'm experimenting with them. Also, I am doing some written work for my Masters course. How much travelling do you do? This varies. Last December was incredible - all over Europe doing a Tour of Bach's Christmas Oratorio. However, it's relatively easy for a Trumpet player to keep busy in December's "D Major" trail. The rest of the year I work mostly within the UK. Last year I was lucky enough to play in Canada, Italy, Germany, Holland, Switzerland, Spain and France. What is your favourite style of music? I love playing Bach. The only way to understand my taste in music is to delve deep into my iTunes library! It is an eclectic mix of musical styles. I love listening to music from all over the world and I love listening to CDs with soul and character and most importantly "a story". Somehow the music means more to me if it reminds me of being somewhere else or how I came to hear it for the first time. I don't like to limit myself to saying that one style is my favourite really as I will listen to anything and get a massive of enjoyment out of it. Do you mainly play your favourite style of music, or something else? I am very fortunate in that I do get to play a lot of Bach's music and I am also lucky that I still play in other styles from time to time. I play in a function band - which is really good fun - and it's so nice not to have to read music for it - basically I just stand in a horn section and make up riffs and licks that fit with the piece we're playing. It's a lot of fun, especially as the others in the horn section are great musicians to be around - and so the musical ideas come thick and fast. Out of all the places you have performed, which was your favourite? The Winspear Center in Edmonton Canada. Also the Chapelle de la Trinite in Lyon, France. Both amazing for different reasons. Where would you like to perform? The Concertgebouw, Amsterdam and actually - probably more: the Thomaskirke in Leipzig. (Bach's church). Is there anyone you would like to collaborate with on a musical project? David Attenborough. He has a wonderful voice and says things in such a rhetorically beautiful way. What is the best bit about being a musician? Undoubtedly, the music. The people are also excellent - usually live wires as well! What is the worst bit about being a musician? The waiting around. I once heard someone say they had spent twenty-five years as a musician: five of them playing and the rest of them waiting. If you won £10million on the lottery, what would you do first? Well, similar to the words of "Jackie" in the film "Waking Ned" - "Well, I'd take what I needed and treat my friends with the rest!" - I would design and self-build a house, complete with a recording studio / hall and then I'd spend about half of what was left on putting on some amazing concerts with great colleagues. What was the last book you read? Stephen Fry's - "The Fry Chronicles" and Kristian Steenstrup "Teaching Brass" (both excellent). If you could have one superpower, what would it be and why? To be able to fly, so that I never have to be seasick again (coming from an Island, this is a slight problem). What would the title of your autobiography be? "That's the story of my life!" (or something equally punning, perhaps involving trumpets). Either way, I don't envisage massive queues forming at the bookshops! 1. My trumpet teacher's trumpet teacher, Bernard Brown said this: "Whenever you hear someone playing the trumpet: stop and listen. It does not matter whether it is good or bad, there will always be something to learn". 2. Walter Reiter said something which has stuck in my mind: "There is no such thing as playing well. You either play expressively or you play badly". …and my own addition to this advice would be: Aspire to be what your colleagues would call "a great colleague" and what they (and the composer) would call "a great musician". The last few weeks have been a busy time musically for all the Sheean Prash's members in one way or another... Sheean Prash trumpeter Helen Quaggin-Molloy took part in the Isle of Man Wind Orchestra's recent brass and wind weekend on 17th - 19th February. This was an intensive weekend of rehearsals which included a workshop concert and the premiere of Colin Touchin's specially composed piece for the IoMWO. A week later on Sunday 26th February Sheean Prash members Julie Harrison and Juan Wright were performing with Douglas Town Band at the North West Regional Brass Band Championships in Blackpool competing in the Second Section performing the late Goff Richard's challenging test piece Cross Patonce. In what proved to be something of a family affair for the Harrison's Julie was joined in the cornet section by eldest daughter Ellie, with husband Adrian on 2nd baritone and son James on percussion. The following weekend (Friday 2nd and Saturday 3rd March) saw Chris Weeks and Juan Wright performing with the Isle of Man Symphony Orchestra in two concerts featuring the music of Edward Elgar which included the Enigma Variations and a very special performance of the Elgar Cello Concerto trnscribed for Viola by the late Lionel Tertis. Soloist for these performances was the IOMSO's leader Tom Field dedicated to his wife Priscilla Hills, herself a highly respected cellist and teacher who sadly lost her battle with cancer last year. 17th February 2012 By Request: You choose the music and we’ll play it! Got a favourite piece you would like to hear brass quintet Sheean Prash perform at their forthcoming summer concert at Peel Cathedral on Tuesday 22nd May 2012? Kevin Ford of 3FM will once again compere the quintet’s concert at St German’s Cathedral with a programme that will consist entirely of audience’s requests. To make your request browse the selected list of music from the quintet’s sheet music library by either visiting the recently updated repertoire page; then make your selection/s (you can choose up to three pieces) and complete a request form. You can either email your completed form to: Juan Wright or you can post it to: 49 Bemahague Avenue, Onchan, IM3 4AP. Alternatively if you’re a Facebook user you can leave a comment on the wall of the Sheean Prash Facebook page. The closing date for completed request forms and wall comments is Monday 23rd April 2012. To download a concert poster click here. Whilst every effort will be made to include as many audience requests as possible some items may have to be omitted due to time limitations and availability. The published list of music is a selection from the quintet’s complete sheet music library and if you do have a request that is not on the published list, you can still request it, although Sheean Prash cannot guarantee to be able to include it in their programme. The final programme will be released during the week of Monday 30th April 2012. 9th February 2012 A Right Royal Affair! Quintet members Chris Weeks and Juan Wright will once again perform with the Isle of Man Symphony Orchestra for their joint concert with the Isle of Man Choral Society and soloists Kristene Sutcliffe and Mandy Griffin, on Sunday 18th March at 3.00pm at the Villa Marina. 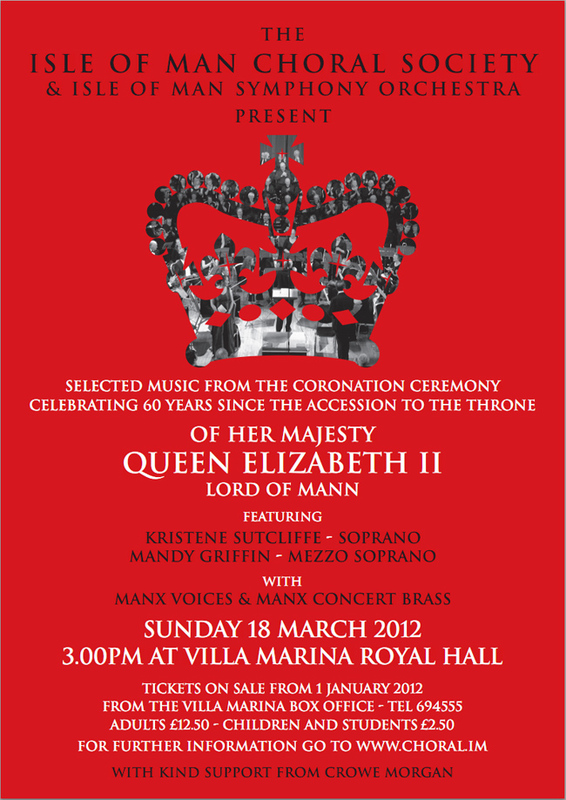 This year’s concert programme is celebrating the Queen’s Diamond Jubilee. It will feature all the music played at her Coronation in 1953 - plus a few extras; including the Hallelujah Chorus from Handel’s Messiah and Rule Britannia. This will definitely present some challenges for the IOMSO, and conductor Julian Power has enlisted extra brass players from Manx Concert Brass for the occasion. Tickets are available from Villa Marina Box Office (600555) or the Welcome Centre at the Sea Terminal 662525. Talented brass quintet Sheean Prash is tuning up to take part in a headteacher’s charity fund-raising appeal by playing in Douglas’s shopping centre. Sheean Prash will perform at The Strand, Douglas, on Saturday 11th February from 2.00pm and is urging the public to come along and give generously. ‘Music to Watch Shoppers Buy’ will include favourites by Mancini, Gershwin and The Beatles. Money collected will go towards Adrian Shorthouse’s fund-raising for Alzheimer’s Society Isle of Man. The head of Scoill Vallajeelt is running the London Marathon in April in memory of his mum, who died with Alzheimer’s, and hopes to raise more than £3,000 for the charity, which is expanding its services in the Island this year in response to need. It’s the 39-year-old’s first marathon. (Click the image above to view a concert poster) Trombonist Juan Wright formed Sheean Prash – Manx for ‘brass sound’ – in 2004 when he was manager of the Erin Arts Centre. He and trumpeters Helen Quaggin-Molloy and Julie Harrison, French horn player Chris Weeks and tuba player Grant Taylor are among the most experienced brass musicians on the Island. They have built up a diverse repertoire including popular classics and modern favourites. In July 2005, Sheean Prash undertook a successful tour of the South of France, performing choral items with a visiting choir and a series of concerts around the Perpignan area. The quintet has assisted a number of local charities, including Age Concern, Manx Landmine Action, Victim Support, Western Live at Home Scheme and, more recently, Crossroads Caring for Carers. Juan, who now works in education, said: ‘We are delighted to be assisting Adrian’s efforts to raise money for such a worthy charity and wish him well in his preparations for the London Marathon in April. For more details about Sheean Prash, either browse their website www.sheeanprash.com or visit their Facebook page. Adrian and friends and colleagues will also be collecting money following Douglas Choral Union’s matinee performance of Miss Saigon on Saturday 18th February and outside Shoprite, Ramsey, on Saturday 25th February. Another venture to assist Adrian in his fundraising efforts is a raffle giving you the opportunity to win some fabulous prizes. Past players have just a few more days to sign up for a celebration of the Manx Youth Orchestra’s 40th anniversary. A reunion of ex-players (which includes Sheean Prash members Helen Quaggin-Molloy and Juan Wright) will take place on the morning of Saturday 24th March at St Ninian’s High School. Ex-members will join the current MYO for an hour and half's rehearsal from 10am before performing a 30-minute concert for friends, family and well-wishers at noon. The music will be selected from the MYO’s past repertoire. A social occasion will follow at 12.30pm. The orchestra, run by the Department of Education and Children’s Music Service, was formed in September 1971 and gave its first concert in the spring of 1972. In October it appealed for ex-members to dust off their instruments and rejoin it for the celebration. The ad-hoc orchestra will be conducted by the current musical director, the DEC’s Head of Music Service Maggie Richardson, and former conductors/heads of music service Graham Kirkland and Bernard Osborne. John, who played with the orchestra as a teenager, will also lead part of the performance. Details of how to obtain tickets for the concert will be available soon. At a post-concert reception, organised by the Friends of the Manx Youth Orchestra, it is hoped to have photographs/memorabilia of the MYO on display. Players and audience members are invited to bring along anything of interest. Following on from the news item that appeared on the website before Christmas about the Manx Youth Orchestra 40th anniversary reunion. 2012 also marks the 15th anniversary of the Isle of Man Wind Orchestra. Sheean Prash trumpeter Helen Quaggin-Molloy is also a dedicated member of the IoMWO and has passed on details of their forthcoming brass and wind weekend, which will be led by guest tutor Colin Touchin. The weekend will include the world premiere of Colin's specially written composition for the IoMWO which includes snippets of a number of Manx melodies including: ‘An opening fanfare uses the theme of “Kelly from the Isle of Man” and there are also references to Mylecharaine’s March, which provides the melody to Arrane Ashoonagh dy Vannin, the Manx National Anthem.’ The work will form the centrepiece for the wind and brass weekend at St John’s School from 17th to 19th February. To view a flyer click on the image above. The weekend will see the wind orchestra tackle other music, including the First Suite in Eb for Military Band Op 28 by Gustav Holst, the theme from Family Guy and a compilation of Frank Sinatra hits. The event is open to all musicians playing wind, brass and percussion instruments regardless of age and experience, even if they don’t usually play with the IoMWO. The workshop weekend will include a social evening on Saturday 18th February and a workshop concert on Sunday 19th February at St John’s School starting at 2.30pm, more details will follow shortly. There are also plans for the IoMWO to perform a 15th anniversary concert on 25th April; again more information about this will follow in due course. The IoMWO rehearses at Marown Primary School at 7.45pm on Thursdays during term-time.